There’s no doubt we live in a digital world. Pretty much anything and everything can be found online, and more often than not, we create or consume content via a digital device like an iPad, a smartphone, a computer or a television. And given how the world is evolving, it’s fairly obvious this is going to become more prevalent as time goes on. It should also be fairly obvious, if you’re a regular reader here, at The Flickcast, or a listener of my podcast, I’m a huge fan of technology and this evolving digital world. What people might not know is how much I also love old school, analog tools and things many people may consider obsolete. Things like pens, pencils, paper, notebooks, watches with hands and more are all as exciting and useful to me as the latest iPad, smartphone, laptop or other piece of technology. I don’t consider them obsolete at all. Far from it. In fact, they are an integral part of my daily life. Given that fact, I thought it would be fun to share some of the analog tools I enjoy so others could hopefully begin to appreciate them and what they have to offer. And sure, my fondness for these analog tools is partially because I grew up in a time when we didn’t have any real alternatives. I grew up in a world before the iPad, iPhone, HD TV, Facebook, Twitter, Instagram, Google and all of the other things we take for granted now. Sure, I had a computer (my first was an Apple II+) but the Internet was in its infancy then and to get “online” you had to use a POTS line and a dialup modem. Yes, it was slow. My God it was slow. But it was amazing too and gave us a glimpse of what was to come. But to do any real work, I used a notebook and a pen. That’s all I needed. I would write papers, reports, notes, stories and more with that trusty notebook and pen. They never failed me, needed a software update, security patch, lost connectivity or had to be rebooted because they froze. They just worked. As time went on, I found myself using the computer more when I needed to print something but I would make my notes, write rough drafts and almost everything else by hand. Then, once whatever I was working on was ready, type it into the computer for the final draft and then print it out using my workhorse dot matrix printer. Yes, we handed in typed (if you didn’t have a printer and computer) or printed papers for school back in the day. Pretty much no one had email and teachers certainly weren’t accepting assignments that way. So, the printed word, on paper, was our content delivery method. And heck, it just worked too. All of this brings me to today. I use a computer every day, have an iPhone, own several iPads and consume content via a large HD TV in my living room. And I still use a notebook and pen each and every day too. In fact, the notes and first drafts of this article were written in my current notebook of choice, by hand, using my favorite fountain pen. Now let’s talk specifics. Actually, before I go on, I should point out that I’m not going to be doing formal reviews of any of my favorite analog tools. I’m just going to be highlighting some of the things I love and use and why I love and use them. Got it? Okay. For many years I was a devout Moleskine notebook user. I had them in several sizes and wrote in them daily. Unfortunately, in the last few years, I’ve seen their quality decline. So about six months ago, I went in search of a new notebook. 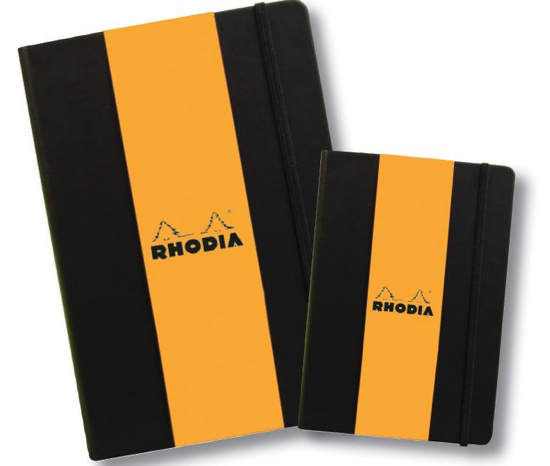 Fortunately, it didn’t take long for me to discover a company called Rhodia and get my hands on some of their products. After using Rhodia products for a few weeks I realized I had a found a new notebook. It’s called the Rhodia Webnotebook (aka the ‘Webbie”) and it’s pretty great. What I like most about it is the hard cover, which helps when using it on your lap, and the way the pH neutral, acid-free ivory paper holds many different kinds of ink and even looks great when you use it with a pencil. I always have one in my bag. I’m also an avid user of legal pads. Although, mine are white, not yellow. 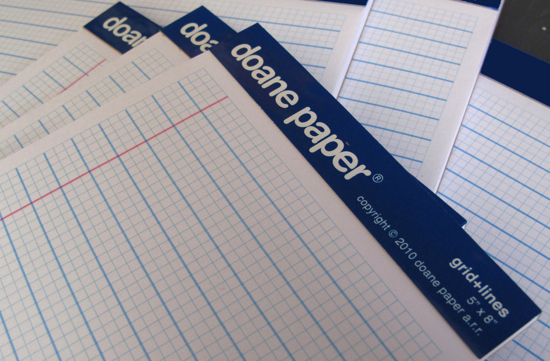 They’re from a company called Doane Paper and I always have one at my desk to jot down notes during a call, write a phone number or address from a website, make notes for a project when they come to me during the day, and more. The pads also have some very nice paper and take a variety of inks and pencils very well. They also have one other great feature: They have both grids and lines. That’s right. The best thing about this is the versatility. You can make notes, write a story or draw a space battleship, all on the same pad. Grids and lines help make it possible. Of course, no discussion of notebooks would be complete without a mention of Field Notes. These little noteboooks come in lots of different colors and are great to keep in a pocket, laptop bag, on a desk or pretty much anywhere you need to have paper handy to write something down. I have so many different styles and colors I’ve lost count. You never know when or where you need one, so I cover my bases by having a lot of them all over the house, in the car and in my pocket. Having some great notebooks and paper is only half the story. 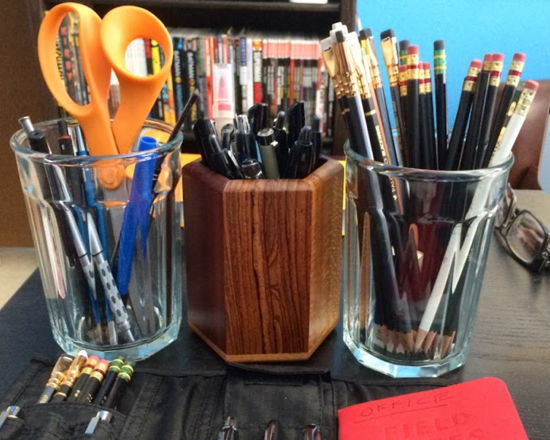 You need some great pens and pencils to go along with them. Naturally, I have a few of those too. In fact, more than a few. For use in the Rhodia Webnotebook, I prefer a fountain pen. My two favorites at the moment are the TWSBI Diamond 580 and the Kaweco AL Sport. No, they’re not the cheapest, but of all the ones I’ve tried so far, they’re the best. The TWSBI, in particular, is very cool with its transparent case allowing you to see inside. It also writes very well and glides smoothly across the paper. Two things you really want in a pen. The AL Sport is awesome mainly because of its size. It’s small enough when capped to slip into a pocket and take with you everywhere. It’s also made very well out of sturdy aluminium and writes quite nicely in the Rhodia, or pretty much any of the other notebooks or paper I use. As far as pencils go, my old favorite was the Mirado Black Warrior HB2. I still use it quite often but it has been replaced of late by something else: The new Palomino Blackwing 602. I know they may look a bit strange, but they write really well on almost any paper. When you add some nicer paper, such as a Rhodia Webnotebook, the 602 really shines. I like it almost as much as the fountain pens. Almost. Pencils do have one big advantage over pens, however. You can erase them. This feature is especially useful if what you write ends up being not what you hoped it would be. You can just erase it and start over. It’s also hard to sketch or draw with a pen, at least for me. So, pencils come in handy pretty often. These are just some of the analog tools I love and use on a daily basis. I like to think I will continue to use them even as the digital world and its tools continue to evolve and become more and more a part of our daily lives. I look at these analog tools as a chance to step away. To unplug and to spend some time away from the constant intrusion of status updates, tweets, pokes, selfies and all the rest of the teeming morass constantly vying for our attention. I think it’s healthy to step back, slow down and get a little perspective. I find it helps me to think and be more creative. Plus, my time is valuable and do I really want to spend so much of it looking at duckface selfies or watching cat videos? This entry was posted in Personal and tagged Analog, Apple, Doane Paper, Field Notes, Fountain Pens, iPad, iPhone, Kaweco, Mirado Black Warrior, Palomino Blackwing 602, Paper, Pens, Rhodia, TWSBI, Writing. Bookmark the permalink.